The Accell USB-C to Gigabit Ethernet adapter easily converts a computer's USB-C port into Gigabit Ethernet port. Add a Gigabit Ethernet connection to a computer, eliminating the slower connection speeds and reducing the security risks that are often present when using a wireless network. The Gigabit Ethernet adapter is compact and highly portable. Powered by the USB-C port, the adapter requires no external power and is ideal for use with mobile devices. 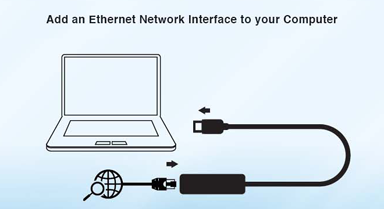 Unlike the connection problems common when using a Wi-Fi signal, the Ethernet adapter will allow you to enjoy a fast and dependable internet connection. Supporting up to Gigabit Ethernet speeds, this USB-C to Ethernet adapter will optimize the speed of the available internet connection. Compliant with USB versions 3.0, 2.0 and 1.1.